As revealed by John Huff, the man behind the brainchild of the Floating Beds, “What would the ideal bed look like, feel like, and what benefits would it provide?” this is like trying to go an extra length into making everyone fall in love with their beds. Having taken a critical look and thus, considered the power of a rocking motion towards aiding relaxation, both the water beds and the four point hangable beds which huff believes is “simply not that good to sleep on, because their motion is all wrong” he had realized that an ideal floating bed would take the principle of a pendulum or some sort of floatable motion. 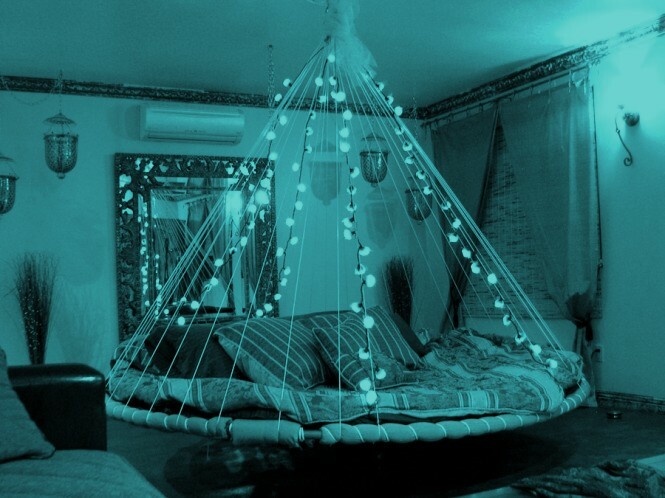 Although this bed is very much cool, the shock is that it was not designed to only serve the purpose of what it looks like, The best gentle motions ar derived from a one-point overhead suspension, the adjustable height is also one of its strengths. Get an ideal floating bed and rock yourself to comfort. Next What Paint Sheen Is Right For My Home?